The City and Guilds 6187 QCF Diploma can be taken at level 2 or level 3. At level 2 candidates specialise in either air conditioning (6187-01) or refrigeration (6187-02. Run as block release in one week sessions it will normally take about 2 years to complete. 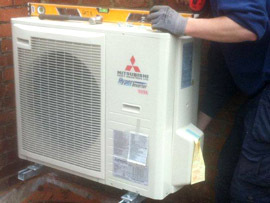 To achieve the City and Guilds 6187-01 Diploma in Air Conditioning/Heat Pump Technology. Successful candidates will also achieve their City and Guilds 2079 in Refrigerant Handling category 1.